﻿ Crown Regency Suites And Residences - Mactan, Cebu | FROM $54 - SAVE ON AGODA! "Superb facilities, wonderful ambiance, the best place I have..."
Have a question for Crown Regency Suites And Residences - Mactan? "Food is pretty decent tho." "First of all, the staff were exceptional." "We are greeted with big smiles in the reception who answered all of our queries." Majestically rising on a sprawling 1.5 hectare landscape is the Crown Regency Suites And Residences - Mactan. This world-class hotel offers the comfort of home with all the services and facilities of an international hotel. 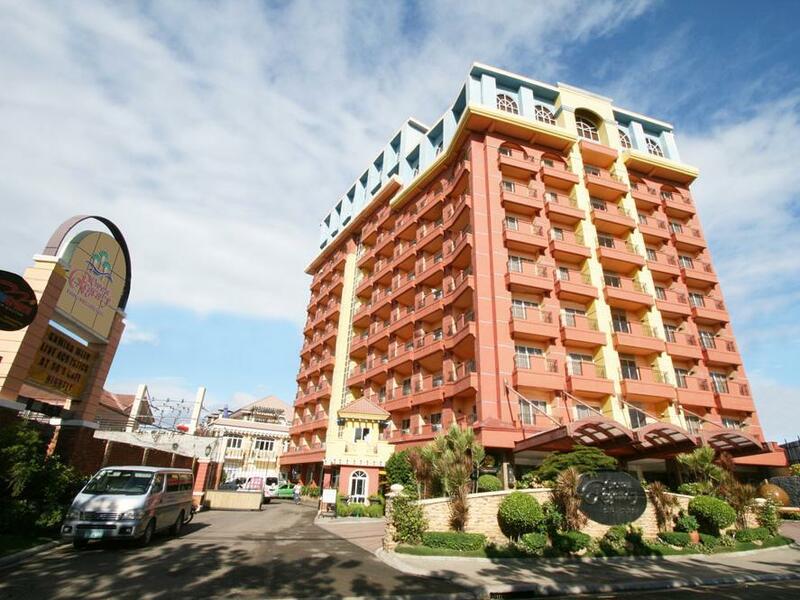 Crown Regency Suites And Residences - Mactan is comfortably close to the Mactan Export Processing Zone II and is only minutes away from one of the world's best beaches and the Mactan International Airport. The well-appointed suites allow you to bask in total comfort and relaxation. In-room broadband Internet access and a full-service business center allow guests to conduct business affairs combining basic functionality with elegant design, and all the little amenities ensure your stay will be a truly memorable one. Superior facilities and amenities ensure your special events and gatherings are made even more memorable. The traveling gourmand will appreciate the variety of food offerings while the health buff will enjoy the hotel's state-of-the-art fitness facilities. Businessmen will find unparalleled convenience at the 4-star business center and functional meeting rooms. 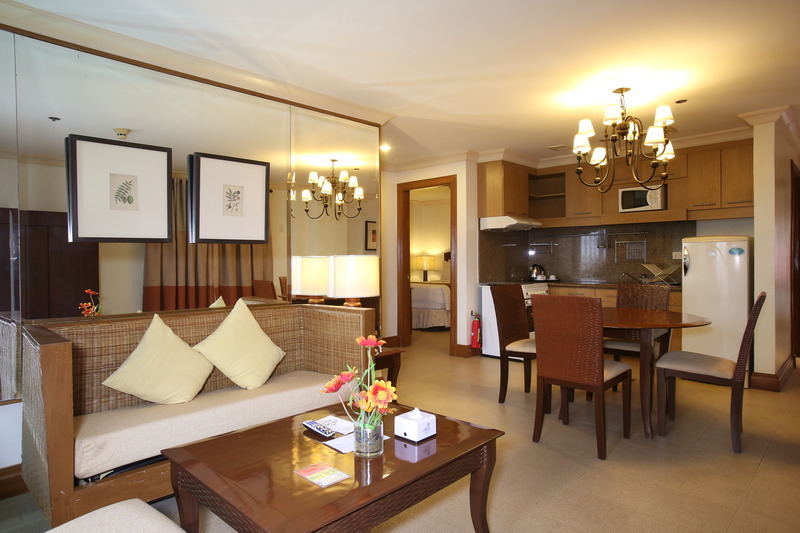 Whatever you fancy, Crown Regency Suites And Residences - Mactan has you covered. 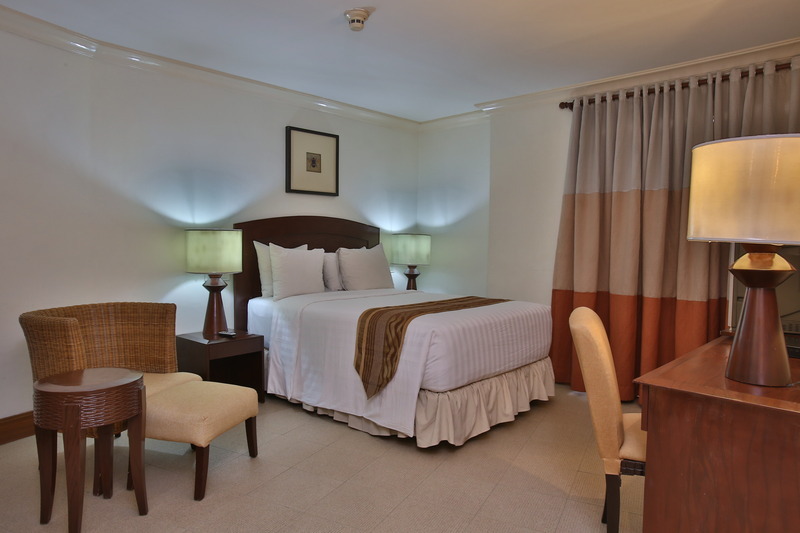 "Crown Regency Mactan is a reasonable good hotel." My family enjoyed the stay. The place is big and feels like home. We enjoyed the swimming pool. I'll recommend the place. The location of the place is around 15-20 minutes away from the Airport. Facade is quite old but definitely clean and the staff is super friendly and accommodating too! Highly recommended if you want a place nearby Mactan Airport. I have stayed in this hotel perhaps 100 nights over the past 5 years. The units are consistently clean with a nice selection of amenities, and the restaurant is very good. The only complaint I ever have, and it was true this time, is that the hot water in the room is sometimes limited. After 30 seconds in the shower, the hot water begins to fade away and in a couple of minutes, it is simply a cold shower. Other than that, no complaints. The hotel had numerous Korean students billeted to study English. These young people were talking in loud voices as they walked thru the 4th floor, and were jumping and shouting in one of the Guestrooms on the 4th floor in the afternoon. This type of boisterous behavior should not be countenanced by the Hotel management. The food here is great try to expand your menu in the area of more Philippines style food and include more street food in your poolside menu . Some thing gets lost in translation when it comes to food. Overall we loved this Hotel. I chose to stay in this hotel as a treat to myself a one of stay during a 3 week vacation . My guest and I were astounded and stressed by what seemed like a hundred Korean guests , children and teenagers who roamed all over the hotel causing chaos and shouting throughout the hotel even as “ observe silence “ posters in English and Korean print were posted everywhere throughout the hotel. They seemed to play in both elevators which became Unusable due to their games. After asking these guest to quiet they start to ring my room bell and just continue disrupting everyone’s peace . 4 more requests to no avail. 2 unanswered phone calls to reception also 2 unanswered emails to front desk . Does anyone care or have any respect in CROWN ???? Offered substandard room on 6th floor Complimentary drinks offered but not supplied until second request . Also had to argue to receive expected 2nd complimentary breakfast. The building is old, the tub, lamps, curtains are worn out and in dire need of replacement. Food is pretty decent tho. The level of service deserves 5 stars. The staff were all smiling and accommodating. The staff is very accommodating. The place is very dated and needs renovations. The hot water only lasts about 5 or 10 mins in the shower. The walls are thin so you can hear your neighbors. There is a as small store if you forget any toiletries . Breakfast was ok. Im plant based so it was not a-lot of choices besides fruit. I had a massage. It was ok. She was about 20 minutes late. She never apologized. Her phone kept going off through the whole massage. She did not have change when I paid. She rushed through the massage. Did not inquiry about problem areas to work on during massage. Massage on the bed and left oil everywhere. The driver at hotel was extremely nice and helpful. Crown Regency Mactan is a reasonable good hotel. The building is old, definitely needs some work to be done. The lobby is outdated, reminds me of the 70's and with some work it could look a lot more inviting. The rooms are spacious, nice and clean. So are the bathrooms. Breakfast is reasonable, enough choice of warm dishes, the bread selection is however very limited. The pool is large and nice. The fitness area definitely needs a lot of work, unfortunately the equipment is outdated and in not too good condition. The location is ok, not too far from Mactan airport, just a 20 minutes ride with the taxi. Last but certainly not least, the staff is (as usual in the Philippines) very helpful, friendly and accomodating. Price is too high for the overall condition of the hotel, should be around 25% lower in my opinion. We expected a lot considering it was a pricey room. It wasn't soundproof. Uncomfortable - because they put us in one of two connecting rooms And other than that, it was great. Clean room and bathroom. Clean and comfy bed. I stay at the Crown Regency every time I come to Cebu. The staff is all pleasant, the food is very good, the room is large, filled with amenities, and clean. The only complaint I would have is that the internet is intermittent in the room. We stayed at the 6th floor corner room and it was noisy all night from the vehicles driving along the street . We also felt the room shake , bec there was a low magnitude earthquake. Limited supplies , no face towels . They have a free shuttle to airport, staff was courteous. Overall it was an ok place to stay . First of all, the staff were exceptional. 1. We are greeted with big smiles in the reception who answered all of our queries. 2. The manager opened the breakfast buffet earlier so as to accommodate us because our flight is in the early morning. 3. They are all friendly. 4. Free pool use, has a 24 hour shop and coffee shop downstairs as well. 5. Location is 10 mins away from the airport and they provide free shuttle to drop you off that runs every hour. 6. The room is quite spacious and clean Cons: 1. The place needs some renovations. 2. The pool shower area needs to be totally replaced. 3. They need to work on the old building scent lingering in their hall ways. The pics posted on the web of there hotel were very deceiving. The rooms haven’t been updated besides the TV in many years. Having roaches and a lizard sleeping with us in the room was uncomfortable and only tells me that the cleaning here needs way better attention especially when you walk around the room barefoot and see that your feet are black when you go to bed. I mean really.! They do have however a restaurant on site called Fiftes Cafe with very cool antiques but takes going through a maze up and down stairs to get there. Don’t be fooled by the pics making you think you’re going to be staying in the rooms that look like a residence because your not. We are booked last August 15-17, Great Value for Money! Staffs were very accomodating, free shuttle from the airport and going to to airport also. Great hotel to stay specially with kids. Big swimming pool, fast wi-fi, fast housekeeping service. Sure to come back with kids nman. Always good to stay here, stayed many times over last 4 years. Easy trips into Cebu for malls and other tourist things. Rooms are very big, good kitchen and amenitites. shower is nice. Beds are lovely and soft and big. Aircon is good, has nice pool and the bar/resturant at night times is nice.Breakfast choice didn't look that inviting for a foreigner so gave it a miss this time.